Residue-free disease management. Natural, effective and organics approved. Natural tool for management of foliar and wound diseases like Botrytis and Eutypa. 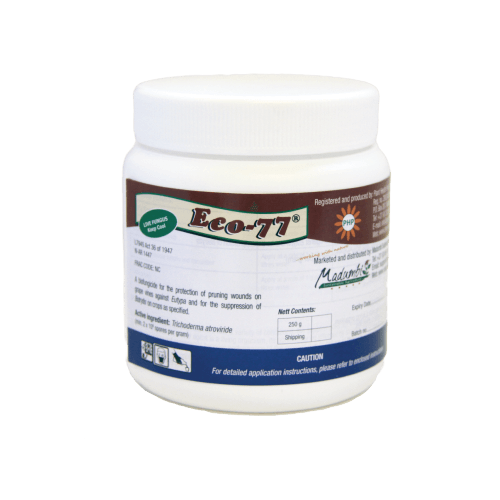 Eco-77 has been isolated from pruning wounds up to a year after application. Reduces plant losses and aids recovery from mechanical or weather related injury (i.e. hail damage). Fewer plant losses resulting from wood rot pathogens like Eutypa. Reduces orchard and vineyard replants and improve productive life as a result of disease prevention. Ideal, residue-free, IPM and resistance management tool. Concentrated WP formulation of beneficial fungus Trichoderma harzianum strain 77. Locally isolated strain originating from extensive research conducted by the ARC. T. harzianum fungus grows on wounded tissue, preventing harmful pathogens from entering the plant. Natural organism that works in synergy with the plant. May be applied as both a directed or full-cover spray.